Royal Inns of America opened its $3 million, 200-room hotel in 1970. In 1972, Michael Gaughan and Frank Toti bought out the property's casino operations. In 1979, fast food operator (and former automat chain) Horn & Hardart agreed to buy the Royal Inn for $7.4 million. By late 1980, the sale had been completed, and the property was rebranded as the Royal Americana Hotel, with a New York theme. A $3.5 million renovation increased the room count to 300. By 1982 though, the hotel was experiencing substantial losses, and Horn & Hardart decided it to close it. They reportedly agreed that December to sell the property to an investment group for $15.4 million. The property later reopened as the Paddlewheel Hotel & Casino. It had a kid-friendly atmosphere, with arcade games and amusement rides, but later shifted to an adult focus, including a male revue. Horn & Hardart put the hotel back up for sale in 1990. It did not sell until 1992, when actress Debbie Reynolds and her husband Richard Hamlett bought the closed Paddlewheel at auction for $2.2 million. Reynolds planned to spend $15 million on renovations, including adding a museum to house her collection of Hollywood memorabilia, and a 500-seat theater where she would perform. The property reopened in 1993, with the casino operated by Jackpot Enterprises, but Reynolds struggled with the financing to complete the project. She took the company public in 1994 to raise money, and the museum finally opened the following year. The casino closed in 1996 after Jackpot pulled out because it was unprofitable, and Reynolds could not get a gaming license to operate it in-house because of the company's poor finances. After a deal to sell the property to timeshare developer ILX Inc. for $16.8 million fell through, Reynolds and the hotel both filed for bankruptcy protection in 1997, and the property was put up for auction the following year. The winning bidder at $10.65 million was the World Wrestling Federation, which planned to level the building and construct a 35-story wrestling-themed hotel and casino. They stripped much of the interior in preparation for demolition, but ultimately decided the site was not big enough. The hotel was open for a short time (including October 2000) as "Convention Center Drive Hotel." They sold it to Chicago-based Mark IV Realty Group in 2000 for $11.2 million. Mark IV hoped to redevelop the site with 1,000 rooms, but instead remodeled the property with a Greek theme and reopened it as the Greek Isles in 2001. The Greek Isles contracted with Delta Air Lines to house flight crews during layovers. In July 2007, the hotel was sold to a real-estate developer (DI Development Group) for $48.8 million; the developer announced in January 2008 that he was pursuing financing to redevelop the site, replacing it with a mixed-use development, proposed to include 780 hotel rooms, a 77,000-square-foot (7,200 m2) casino and 71,200 sq ft (6,610 m2) of convention, retail, and restaurant space. The developer never came through, and the hotel tried expanding operations. The hotel was forced into bankruptcy on April 6, 2009, by its creditors. Canpartners Reality (owned by Canyon Capital Reality Partners and Spectrum Group Management) took over control on August 19, 2009, taking possession of the foreclosed property. As of April 2013, the hotel was branded a Clarion Hotel, the only Clarion with a casino. The 300-seat theater built by Debbie Reynolds was used for a Sunday Gospel Brunch and a nightly show. The hotel closed on September 2, 2014, after the Labor Day weekend. Its contents and inventory were put up for sale. In October 2014, developer Lorenzo Doumani purchased the property for $22.5 Million. The Clarion was demolished by implosion shortly before 3 a.m. on February 10, 2015. Following the implosion, the elevator shaft of the building did not fall as intended, remaining mostly intact. It was pulled down about 13 hours later by cables attached to a crane. Sunday, Feb. 8, 2015 | 10:13 a.m.
LAS VEGAS (AP) — With a 4,400-pound explosive punch, a Las Vegas hotel turned into a pile of rubble early Tuesday. 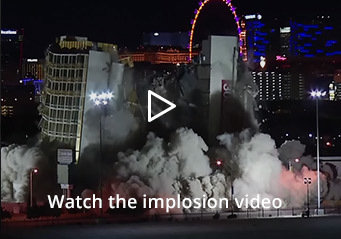 After a post-implosion delay lasting nearly 12 hours, the final piece of the Clarion Hotel and Casino collapsed into Las Vegas history on Tuesday afternoon. Tuesday, Feb. 10, 2015 | 5:49 p.m.